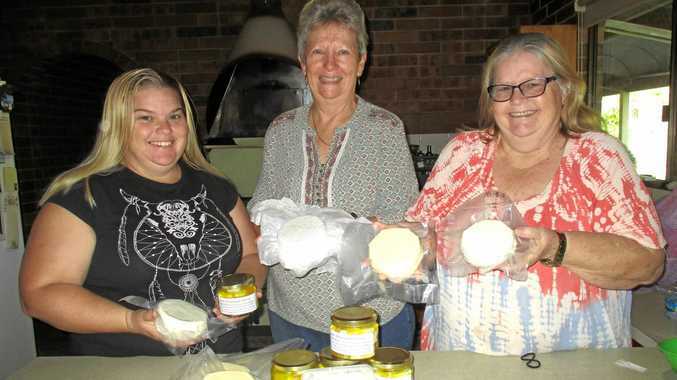 SAY CHEESE: Sharon Le Page (left), Kath O'Donnell and Judy Houben with a selection of cheeses they've entered in this weekend's Maleny Show. WITH a love of tasty cheeses, a few of the local lasses have joined together to make their very own - poring through books for different ideas and varieties and giving each cheese its very own, unique flavour. The Widgee Cheese Makers was born through the efforts of Kath O'Donnell and Judy Houben, aided and ably abetted by Sharon Le Page. Together they are off to the Maleny Show this weekend (June 3-4), entering 12 different cheeses, some made from our very own pasteurised Cooloola Milk while others from pasteurised buffalo milk from Witta. Varieties include chabichou, quark, Greek feta, both single and double brie as well as matured and vintage cheddar. This is their first competitive venture with their cheeses, and we wish them well at the Maleny Show. IT'S the June markets tomorrow (Sunday, June 4) at Widgee in the grounds of the General Store. Come along and grab some bargains while browsing through Joan's preloved clothes and linens and check out Kath's amazing Kitchenalia. There's also Connie's Corner stall with lots of interesting puzzles and books while Ron sells LEDs and solar lights. This month Marlene will be along with her fresh produce, jams and spreads and the U3A Retro Juke Box Singers will keep everyone boppin' with some great songs from the '50s and '60s. Don't forget the sausage sizzle, keeping the hunger at bay. The Widgee Markets are held on the first Saturday of the month, from February to December. New stall holders are always welcome to come along and join the fun. Sites are only $5 with all proceeds benefitting the Widgee Pony Club. Inquiries Jim Clone 5486 1180. THOSE audacious Volunteer Fire Fighters will be hotting up the Bushman's Kitchen this weekend, cooking up a medley of appetizing meals. Topping the menu is luscious T-bone Steaks and appetizing fillets of Beer Battered Barra; both served with heaps of hot, crisp chips and fresh garden salad. And check out the winter warmer on the dessert trolley where you'll find bowls of delicious Chocolate Pudding. A great finish on a cool night. The Bushman's Bar & Kitchen offers family friendly dining with room for the youngsters to play, plenty of off-street parking and a great atmosphere. With the cooler weather now upon us you can warm yourself by the wood fire as you enjoy your meal. The kitchen is open from 6.30-7.45pm with the bar opening from 3 today (June 2) and around 4pm on Saturday afternoon (June 3). Inquiries to the hall on 5484 0282 during opening hours. PURE Patchwork members will meet this Monday (June 5) at the Community Complex in Power Rd, Widgee. From 9am you'll hear the scissors a-snippin' and the machines a-humming as they create intricate designs for bed covers, quilts and throws. If you'd like to find out more about the Widgee quilters, phone Margaret Fittler 5484 0420. AFTER such a hectic day last week, Widgee Craft Group members were happy to sit out in the sunshine and relax on Wednesday, catching up with UFOs and discussing ideas for upcoming crafts. Once the re-hash was over everyone enjoyed morning tea - something they never have time for at their cancer fundraisers. Full details and total of money raised will be available next week, Wednesday, June 7, after their general meeting which is starts at 9.30am. Inquiries Alice Burke 5484 9156. IT'S time again for Glastonbury's much-loved annual event - their cancer afternoon tea. The date is Saturday, June 17 from 1.30pm and admission is just $10 per person. It's an afternoon of fun and laughter not to be missed, kicking off with a delicious afternoon tea followed by the proverbial multi-draw raffle, while everyone waits with baited breath for the excitement of their infamous Grocery Grab to begin. Why not come along yourself and bring your friends, for an afternoon of pandemonium and magical mayhem while raising funds to fight cancer. Inquiries Joan English 5484 9126. WIDGEE Pony Club is holding a training Muster this Sunday (June 4) at the pony club grounds off Upper Widgee Rd. The morning begins with a gear check from 9am followed with various instructive sessions and workouts. Inquiries Jim Clune 5486 1180 or Lisa Robinson 0437 840 439.